We recently got to sit down with Caroline Barry and ask her about her latest project,which follows Nellie Bly in 1887 who feigns illness to go undercover in an insane asylum to expose all the injustices that take place there. Read below to learn more about 10 Days in a Madhouse. Was there anything special you had to do in order to prepare yourself for this role? Yes! In most movies, actors will memorize the scenes the day before, or even the same day as they shoot, but for this film I memorized the entire script before we ever began shooting. The director and I wanted to be sure that I was ready to do any scene at any time. It was also important to me to know exactly where I was in time in each scene. Had I been in the asylum two days or seven days? It was really important to me that the audience is able to see how the asylum affects Nellie day by day. Did you find you could easily relate to Nellie’s character? Yes, absolutely. Even before I auditioned, I read that she smiled all the time, and I pretty much have a perma-smile. I also really related to her sense of curiosity and drive, which enabled her to become such a trailblazer for women in journalism and really seek out stories of people and causes that were rarely given a second thought. Were there any notable moments on set you’d like to share? We shot most of the movie in an abandoned asylum, so needless to say there were a lot of spooky pranks going on during filming. One day on set, I was sitting in the room with the heater — which was everyone’s favorite room because it was always freezing — and one of the doors slammed closed. Someone went over to check it out, but there was no one behind the door. All of the usual pranksters were on another side of the building shooting a scene. Two minutes later it slammed again and again, no one. Maybe it was drafts, but I decided I’d rather freeze than go back into that room. I don’t mess with mysteriously slamming doors. How has this project differed from the others you’ve signed onto in the past? 10 Days in a Madhouse was the first project where I felt really bonded with not only the cast and crew, but also to all of the characters. We were shooting in difficult, cold conditions while dealing with an extremely heavy subject matter. Everyone bonded over the experience, but I think more than anything, we felt bonded to the women who had lived through these horrible experiences, and the hope that this movie could bring them better justice in their legacy. Is there a deeper meaning you hope fans will take away from this film? 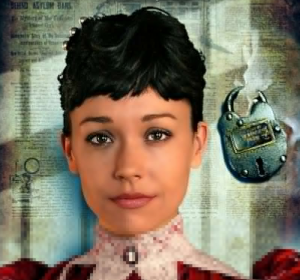 One of my favorite lines in the movie is, “If you give up now, the good may arrive and you will not know it.” I think that perfectly sums up Nellie Bly’s incredible hope and strength, but it is also what she struggles with throughout the movie. Throughout the movie, her hope is the only thing keeping her safe. Do you have any specific plans for writing/acting after 10 Days in a Madhouse? Yes! I am working with Timothy Hines, the director of 10 Days in a Madhouse, on our second project right now. I can’t say too much about it now, but more details will be released soon!